A driver's education course is a vital resource for any prospective driver that wants to be smarter, safer, and more responsible on the road. 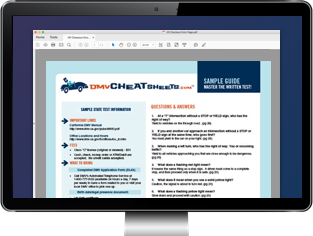 While the Arkansas Driver Services does not require you to complete Driver's Ed before getting your driver's license, it is an invaluable resource for all new drivers. All the basics of being a safe and responsible driver including motorcyclist, bicyclist, and pedestrian safety. What Arkansas road signs mean. The effects of alcohol and other drugs on your driving abilities. 6 hours of behind-the-wheel training on public roads. An ideal complement to your Arkansas Driver's Ed course is preparing for the Arkansas written exam with an online practice test. These study guides have been developed from content sourced directly from the Arkansas driver handbook. It's like having the answers before you take the test! Take an online practice test today and increase your chances of passing the written test on your first try. At private driving training schools. NOTE: Some providers may offer different courses and standards than the one listed above (see “About Your AR Driver's Ed Course" above). Please check with your provider directly for more information about what their specific Driver's Ed course consists of. After Arkansas Driver's Ed – What's Next? If you do decide to take Arkansas Driver's Ed, we're behind your decision 100%. Similar to an online practice test, Arkansas Driver's Ed is another perfect way to prepare for obtaining your learner's license. You can apply for your Arkansas learner's license once you turn 14 years old. You'll need to pass both a written and driving skills test. For more information, please refer to our page on Drivers Permits in Arkansas. Once you turn 16 years old, you can move on to an intermediate driver's license as long as you didn't have any serious accidents or traffic convictions in the last 6 months. The final step of the graduated licensing program is getting your regular driver's license when you turn 18 years old. You will be eligible for an AR driver's license as long as you didn't have any serious accidents or traffic convictions in the 12 months before your application. For more information about the different types of driver's licenses, including driving restrictions, fees, and documents you must show, see our Applying for a New License (Teen Drivers) in Arkansas page.